Here are the free synth albums! In a nutshell, if you’d like to understand where Animoog comes from, from the very beginning of sound synthesis and modular synthesizers up to now, I strongly encourage you to watch the ‘I dream of wires’ documentary. When I discovered and fell in love with Animoog, I knew very little of electronic music — its origins and history. While I’ve been slowly learning, I watched ‘I dream of wires’ over the weekend and not only numerous pieces of the puzzle found their place, but I learned much in this information-packed documentary. While the documentary focuses on the modular synthesizer, I consider it really helps understanding where Animoog comes from — its sound design capabilities and even its user interface. Animoog is even shown for a second or two in the documentary itself, the only app to make an appearance. While Animoog.org launched over 18 months ago, we haven’t published Animoog video tutorials, until now! The first set of videos I’m proposing, from Dubspot instructor Matt Cellitti, are from 2012! But despite their age, content is still pretty pertinent. I particularly invite you to watch the first two 10-minutes videos which focus on understanding how sound design works in Animoog. While I consider myself more of an Animoog player than a sound designer, it quickly become useful to learn how to shape and sculpt Animoog presets to your taste. The videos obviously don’t cover everything Animoog players should know, but it’s an excellent introduction and chances are you’ll learn useful things you didn’t know. So here they are! I’m happy to present to you my second video for the ‘Unanimoog, escape inside the music [Unmastered]’ album. It’s for the 45th track named ‘And back to space’ which is a solo improvised with the Animoog app. Playing a single Animoog preset in solo is just like playing a raw violin solo: a single instrument played live without loops, sequencing or external effects. Because of the expansive frequency content and harmonic complexity of Moog’s Animoog iPad app, along with the heavy presence of stereo ping-pong in the preset, please wear high end headphones to fully enjoy the track. All of this work is licensed as Creative Commons CC-BY. Liked the track? My latest album contains 47 such Animoog solos, leveraging numerous different presets. Learn more about it here and listen to it. 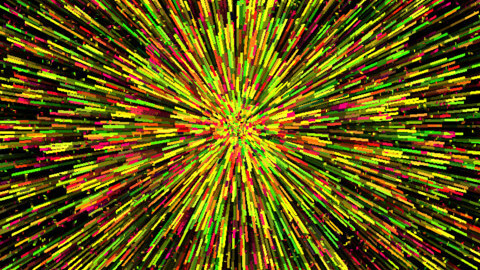 The whole video is made from a single run of the iTunes visualizer. Anyone with a Mac or Windows computer and the free iTunes software can make similar videos live, that’s several hundred millions people! The entry for my first and similar video for the ‘Curious explorer’ track details the iTunes visualizer shortcuts, even the hidden ones, and tells you how to make the best out of it. I’m also working on a longer article which would provide even more details. I’m happy to present to you my first video for my ‘Unanimoog, escape inside the music [Unmastered]’ album. It’s for its fifth track named ‘Curious explorer’ which is a solo improvised on the Animoog app with the ‘Daemian 1 – Phatty Saw’ preset. Playing a single Animoog preset in solo is just like playing a raw violin solo: a single instrument played live without loops, sequencing or external effects. Because of the expansive frequency content and harmonic complexity of Moog’s Animoog iPad app, along with the heavy presence of stereo ping-pong in the Phatty Saw preset, please wear high end headphones to fully enjoy the track. All of this work is licensed as Creative Commons CC-BY. The whole video is made from a single run of the iTunes visualizer. Anyone with a Mac or Windows computer and the free iTunes software can make similar videos live, that’s several hundred millions people! I recorded the video with Quicktime, which can record a screencast. I however had to change the screen resolution of my old mac to the lowest possible (1280 x 720 pixels) to reduce the stuttering during recording. The simple montage was made in iMovie using one of its default themes. The following instructions tell you how to play and fully enjoy the iTunes visualizer yourself, at the full resolution of your screen and, of course, no stuttering since you’ll be playing it live. It’s a much nicer experience than what is shown on the video. I only played with the iTunes visualizer for less than an hour, I suspect someone’s skills after more practice means great fun. Any other key Annoying sound Avoid hitting unpaired keys! The two improvements I’d like to see to the iTunes visualizer: (a) easy control for the number of cores in the scene, and (b) full control on how close or far we are from the cores.